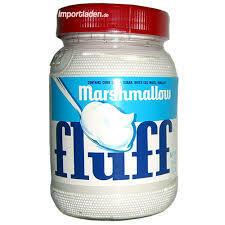 Marshmallow fluff, how I love thee! I was raised in an Islamic household and we weren’t allowed to eat or bring in any products that contained swine(pork products) and that includes gelatin. Even though I didn’t follow the religion, I respected my parents house and never brought those items into the house. That included my love for marshmallows. Any chance I had to eat them outside the house, I did! Then, one day, while spending time with my Aunt and cousins, I was served this heavenly, light, white, sweeeeeeeet, concoction. And here’s the best part: she told me that it was a kosher product! Oh sweet Lord, thank you! I immediately went home and begged my mother to get it from the store during her next grocery trip. Moving forward many years, while I was preggers with my boy and too hot and fat to go to the store, I craved some fluff and I craved it bad. Hubby still had six hours at work and I had to think fast. I googled this recipe and still make it to this day. It makes about 3 mason jars full of the stuff for the price of 4 eggs. So cheap! This is great on top of your favorite pie or ice cream or of course, a fluff-n-nutter sandwich(hey, it is back to school time)! In the meantime, in a completely clean, dry mixing bowl, beat the egg whites, salt and cream of tartar(vinegar or lemon juice) until creamy and foamy, about 2 minutes. A stand mixer with a whisk attachment is best for this, especially for the next steps. Still whisking, sprinkle in the remaining 1 tablespoon sugar and continue to whisk until the whites hold very soft peaks(the foam bends when you look detach the whisk and turn it upside down), about 2 more minutes. While mixing on low speed, carefully drizzle in the hot syrup. Turn the mixer to high and whisk until thick, fluffy and just warm, about 7 minutes. Turn the mixer to low and pour in vanilla. « A Panic attack saved my sanity….